It is now possible to make payments for things like events and trips using a secure online payment system. You will receive details of how to access the system with the next event or trip notification sent to you. Don’t have a letter? Please either call the school finance office on 01458 832943*, or email sgerrard@stdunstansschool.com giving your child’s name, and we will provide you with all the details you need to get started. *Please note that calls may be recorded for monitoring purposes. Need some help or guidance using ParentPay? Feedback from a recent Parent Forum found that parents felt it would be helpful to have a list of frequently asked questions which they can refer to. 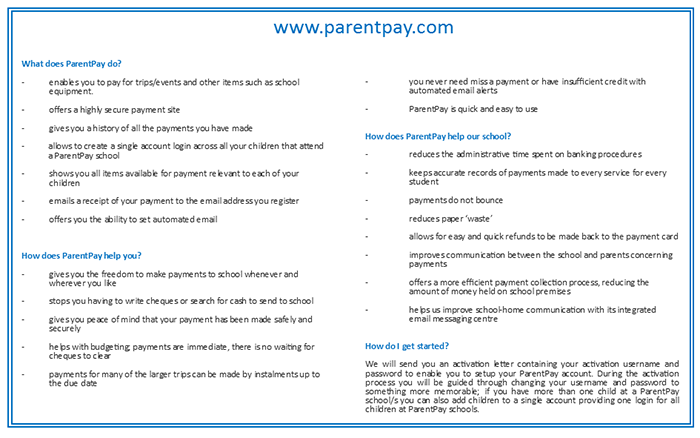 This information can be found by logging onto either www.parentpay.com or via the Norton Hill website, www.nortonhillschool.com under ‘Quick Links’ at the bottom of the home page. ‘ParentPay Support’. This will open up the Support Site. Within this site there is a vast amount of information regarding the registration process, forgotten username/password, how to merge accounts. It also provides answers to the most frequently asked questions. Take a Tour – you can take a tour (which explains the basics of ParentPay) using various slides to illustrate. Whats New – this will bring you up to date with any new features/functions that ParentPay have or intend to introduce in the near future. This is constantly being updated. Help and Support – FREQUENTLY ASKED QUESTIONS ARE IN THIS TAB. Here you will find the answers to the most frequently asked questions. There is also a ‘search’ facility which you will need to enter the key words and it will provide various solutions to your queries. If you are unable to resolve your queries after referring to the Support Site, please contact either the school or ParentPay. ParentPay is a secure website which will enable you to pay online using your debit/credit card. This is our preferred method of making payments to school. In future, we will only accept cash/cheque in exceptional circumstances. enables you to pay for trips/events and other items such as school equipment.